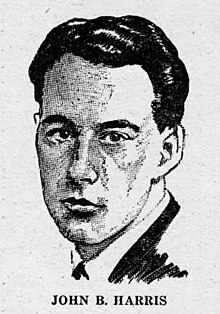 Scríbhneoir Sasanach ab ea John Wyndham Parkes Lucas Beynon Harris (10 Iúil 1903 - 11 Márta 1969). Is é an t-ainm cleite is minicí a chleachtaíodh sé ná John Wyndham, cé go n-úsáideadh sé leaganacha gearrtha eile dá fhíor-ainm freisin, ar nós John Beynon nó Lucas Parkes. Sa chuid ba mhó dá chuid scríbhneoireachta, bhíodh sé ag plé olltubaistí domhanda agus an dóigh a dtiocfadh an cine daonna chuige féin arís i ndiaidh na tubaiste. Mac dlíodóra ó Warwickshire a bhí ann, agus i ndiaidh dó freastal ar scoileanna éagsúla, go háirithe Scoil Bedales i Hampshire, thug sé aghaidh ar an saol agus bhain sé triail as gairmeacha difriúla beatha. Chaith sé tamall ag feirmeoireacht, tamall ag staidéar dlí, agus tamall ag obair do ghnólacht fógraíochta, ach ní raibh mórán ratha ar na hiarrachtaí seo, tríd is tríd. Le linn an Dara Cogadh Domhanda, bhí sé ag cinsireacht ar dtús, ach ansin, chuaigh sé sna saighdiúirí. I ndiaidh an chogaidh, chrom sé ar an scríbhneoireacht arís, agus é ag iarraidh stíl nua a thabhairt isteach san fhicsean eolaíochta, stíl chiúin intleachtúil a bhí bun os cionn ar fad leis an gceoldráma spáis agus leis na cathanna móra spáis nár thaitin le Wyndham. 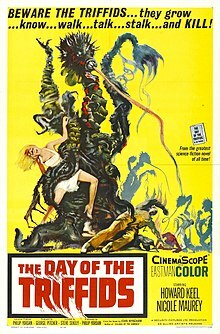 Ba é The Day of the Triffids an chéad úrscéal a scríobh sé sa stíl seo, agus thabhaigh sé an-chlú dó. Sa bhliain 1963, phós sé bean darbh ainm Grace Wilson a raibh aithne aige uirthi le fiche éigin bliain anuas. Chuaigh siad ina gcónaí i bPetersfield i gContae Hampshire, in aice le Scoil Bedales, an ceann ab fhearr le Wyndham de na scoileanna ar fad ar fhreastail sé orthu ina bhrín óg dó. I bPetersfield a shíothlaigh sé sa bhliain 1969. San am sin, bhí a chuid luathshaothar ó na hirisí Meiriceánacha á gcur in athchló, agus foilsíodh cuid áirithe dá chuid scríbhinní an chéad uair i ndiaidh a bháis. Bhí sé ag scríobh scéalta agus á bhfoilsiú ar irisí Meiriceánacha roimh an gcogadh féin, ach is i ndiaidh an chogaidh a tháinig an chuid is clúití dá shaothar ar pár, go háirithe na húrscéalta The Day of the Triffids (1951), The Kraken Wakes (1953), The Chrysalids (1955), The Midwich Cuckoos (1957), Trouble with Lichen (1960), Chocky (1968) agus Web (foilseachán iarbháis, 1979). Bíonn imeachtaí a chuid leabhar suite i saol na Ríochta Aontaithe sna caogaidí, agus iad ag taispeáint saol ciúin idileach á stróiceadh as a chéile ag olltubaiste a bhaineann don domhan go léir. 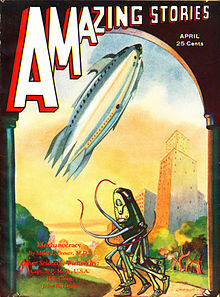 Sa leabhar The Day of the Triffids, tá an cine daonna ag brath ar na "trifidí", sórt plandaí géin-ionramháilte a bhfuil nimh iontu agus iad in ann pairilis a chur ar an duine agus é a dhíleá is a ithe. Tálann na trifidí ola úsáideach, agus slí bheatha thábhachtach is ea feirmeoireacht na dtrifidí ar fud an domhain. Go tobann, buaileann cith dreigí an Domhan, agus fágann solas aisteach na ndreigí an cine daonna ar fad gan radharc súl, amach ón dornán nach bhfaca na dreigí. Nuair nach bhfuil aon duine ag tabhairt aire do na trifidí a thuilleadh, tá deis acu éalú leo as na feirmeacha agus na daoine a ionsaí. Scannánaíodh an t-úrscéal seo an chéad uair sa bhliain 1962. Bhí léiriú teilifíse de le feiceáil ar an mBBC sa bhliain 1981 don chéad uair. Sa bhliain 2001, d'fhoilsigh an scríbhneoir Simon Clark an t-úrscéal leantach The Night of the Triffids, ag tabhairt cur síos ar fhorbairt an tsaoil i ndiaidh imeachtaí an bhunleabhair de réir a shamhlaíochta féin. Tugadh an leathanach seo cothrom le dáta an 11 Márta 2018 ag 22:49.